This stage commences by heading through the long line of coastal settlement between Batemans Bay and Malua Beach, though it uses cliff-top walking tracks, beaches and rock platforms to take in the superb views. From Malua Bay, the coastal villages begin to spread out again as you pass a series of beautiful coves and headlands backed by dense forest, passing the quiet village of Rosedale with Jimmie’s Island just offshore to reach Guerilla Bay.At Guerrilla Bay, a small circuit out through the heath of Burrewarra Point offers great views of the coastline, its backing mountains and route southwards. Crossing some more forest of spotted gums carpeted with cycads brings you out onto Barlings Beach and the rock-sheltered entry of the Tomaga River. It is time for another brief swim to cross the Tomaga and reach Mossy Point, where a short stroll around the headland at the back of the coast houses brings you to beautiful Broulee Beach, blocked to the south by Broulee Island. 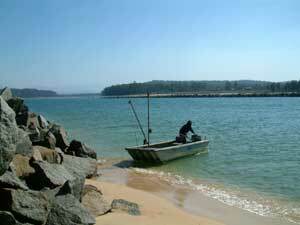 Crossing the small headland facing the island, you commence a long 6km stretch along Bengello Beach. There are sandy heathland tracks that parallel the beach if a change of scenery is needed. The beach ends at the mouth of the Moruya River, a major obstacle as it is deep and has strong tidal currents at the breakwater. 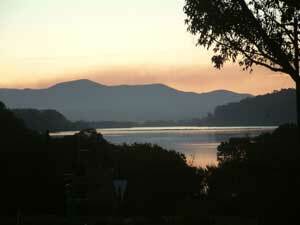 The alternatives are to arrange a boat hire to come from Moruya, 6km upstream, to take you directly across to Moruya Heads or to follow the river for that distance and cross at the Moruya Bridge, and then follow the southern bank of the river back to the coast – a long detour. From Moruya Heads, you walk through banksia and casuarina forest to reach the tiny village of Congo, set between the tranquil waters of Congo Creek and the spectacular orange cliffs of Congo Head. 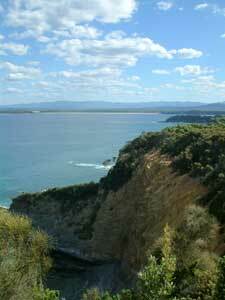 This part of the coast is part of the Eurobodalla National Park and most of the next few days walking will be in it. South of Congo, the cliff rocks change to the black of basalt, as you pick up the Bingie Dreaming Track. This track takes you past aboriginal middens and stone-flaking sites as it wanders southward along the coast through wind-sculpted coastal heath, past dark basalt rock platforms and the pastures of old dairy farms. It passes Meringo to finish at the geologically complex Bingi Bingi Point. The section ends with a 5km walk down the soft golden sand of Bingie Beach and past the sandbarred entrance to Coila Lake to arrive at the village of Tuross Head, in its lovely setting between Coila and the neighbouring Tuross Lake. The only track issue in this section is crossing the Moruya River. The river mouth is wide and deep and cannot be swum and the nearest bridge is 6 km upstream, which makes for a long detour on foot. When we did this 12 years ago, we arranged for a local oyster farmer to travel up to the river mouth and ferry us across - such an arrangement might be available on a regular basis, but could be relatively expensive, as it would take an hour for the boat to travel up to the mouth and back to Moruya.